Happy Sunday, folks! I'm testing and reworking cake recipes this weekend so today I have a guest post from Mother Humble: Her Halloumi rolls. The family is very fond of these soft, cheese filled rolls (a bit more so than we are of her bottomless bag of cheese jokes). (Hallou-mi - get it?) Love that joke! Feel free to use that one – but make sure your guests have had a few glasses of wine before you do. It’s better that way. In a small bowl, combine the yeast, sugar and warm (not hot) water. Stir to dissolve and then set aside until the mixture is foamy. In the bowl of your mixer, equipped with a dough hook, add the flour, salt and powdered milk. Stir to combine. Add the egg and vegetable oil and stir. Turn the mixer onto medium and add the yeast mixture. Blend until combined. Raise the mixer speed to high and mix until the dough pulls away from the side of the bowl (roughly 3 minutes). Coat a bowl with a generous amount of olive oil and add the mixed dough. Cover with a kitchen towel or plastic wrap and place in a warm location to rise. After about an hour (depending on how warm your room is) the dough should have doubled and will be ready to fill. While waiting on the dough you can prep the filling. Rise the halloumi under cold running water, or if you are using the akawi cheese (packed in brine) soak it, submerged in water, changing the bath three times to remove the brine. Drain the cheese and shred it and the mozzarella on the large holes of your grater. Combine the cheese with the chopped herbs and toss to mix. When ready to form your rolls, preheat the oven to 475°F and prep a 12" cake pan by brushing it with a generous amount of olive oil. Prep two small bowls. One filled with a small amount of olive oil, the other filled with the nigella and sesame seeds. Punch down the dough and grease your hands with olive oil. Flatten a walnut sized ball of dough in the palm of your hand, stretching it to fill your palm. Place a tablespoon of the cheese mixture into the center and gather the edges of the dough around it, pinching it to seal. Dip the smooth side of the cheese filled dough into the olive oil and then into the seed mixture and place it seeds side up in your prepared pan. Repeat with the remaining dough, arranging the rolls in concentric circles in your pan. Drizzle a little olive oil over the rolls and bake until they are golden, about 25-30 minutes (until the dough in the center hits an internal temperature of 190°F). Transfer the pan to a wire rack and let the rolls cool for a bit. Run a knife around the rim of the pan to loosen the rolls. Invert a plate over the pan, flip the plate and pan together, and remove the pan. Invert a second plate over the rolls and flip again, so the rolls are seed side up. Place the plate on the table and let your guests pull one roll at a time from the loaf. These look amazing, and perfect for the dinner party I'm having this weekend! This looks delicious! I may try it for a party coming up! OMG they look so nice!!!!! Perfect for an aperitif....they must be so delicious!!!! Cheese a jolly good fellow! Wow those look amazing! I really love haloumi cheese, I've only ever eaten it fried in a pan with a drizzle of lemon juice. Lisa and Linda - you are so cool. You Humbles are amazing bakers! :) I have no powdered milk, will powder buttermilk work, Mother H.? Q. What cheese is made backwards? Wow these look like cheesey divine intervention! I'm sold! New follower here thanks to Ms. Kay Heritage! And it's so fab to see another Seattle Foodie!! Can't wait to see what you Humble baker's whip up next. ~Megan P.
Oh I just love that your mother guest posted! Halloumi has got to be one of my favorite cheeses and these rolls sounds super delicious! I knew this post thread would turn into a cheese joke extravaganza! When we don't have powdered milk on hand we simply substitute 1c. warm whole milk for the warm water. I absolutely love halloumi with just about anything...or on its own, I'm not fussy! I can't wait to give these a shot to accompany something simple like soup, they look deeeelish! I really enjoyed the guest post - thanks Mother Humble. oh wow. these look absolutely amazing! i would so make these now, if it weren't for the fact that im having a bbq tomorrow and it would be a shame if i didnt have any halloumi to grill! Go Mother Humble!! Those look incredible! These looks so cute I can't wait to make them. Thanks for the recipe! A-mazing! These look so tasty! Oh so many great cheese jokes! I'm in heaven. What kind of cheese do you use when you need to hide a horse?? Cheese jokes - they just don't get old. she went on a cheese diet in order to cheddar a few pounds!! ...could not help but pass this along! Oh wow is that drool-inducing. Thanks Mother Humble! I'd love to see more savory delights! The rolls are delicious and so easy to make. 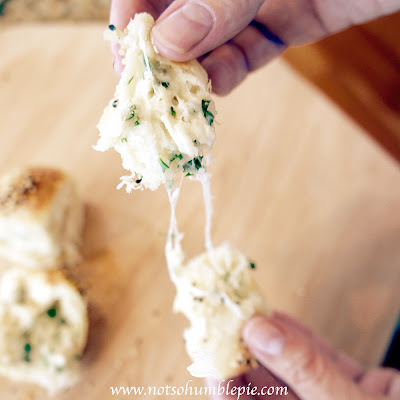 The dough is so light and tender and the cheese herb mixture lovely and subtle. Hope we see more of you on the blog. I finally managed to make these last weekend.... It took three trips to the supermarket, but I managed it! They looked and tasted fab, and the tasty smackerels were met with lots of oohs and aahs, and went down a treat... This weekend, I had all the ingredients in the house, except for the halloumi, and decided to make them again - just for the two of us. Lessons learnt- doubling the amount of filling you put in can lead to less tidy results, and you need the halloumi for the salty loveliness (I did chive and mozzarella). With the other half of the dough I dumbed things down a bit, mixed marmite with butter, and put a small dollop of that in with some Edam cheese. Trashy, but lovely! Thanks for a quick easy and pretty dish.